Luigi spent each day rowing his gondola down the canals of Venice, Italy. Tourists paid a lot of money to go for rides. Luigi sang songs and told his passengers about the history of the city. Sometimes he had Italian gelato for them to eat as they road the gondola past old houses and palaces. One day Luigi picked up a family. There were five children, a mom, a dad and a pet dog. The entire time the children fought with each other, hit each other and the littlest one cried. The dog barked and by the time Luigi dropped them off at the Rialto Bridge, he had a headache. The next passengers were a man and his wife. As Luigi rowed the gondola along, the man and woman shouted at each other. The wife tried to push her husband into the dirty canal water and then she hit him with a sausage. Luigi pulled the boat over and let them out. His head throbbed. If that wasn't bad enough two men, who had drunk too much wine, climbed in. Luigi rowed as quickly as he could while the men made rude noises and shouted things at people they passed. By the time Luigi went home that night, his head hurt so bad that he lay down and fell asleep without eating supper. 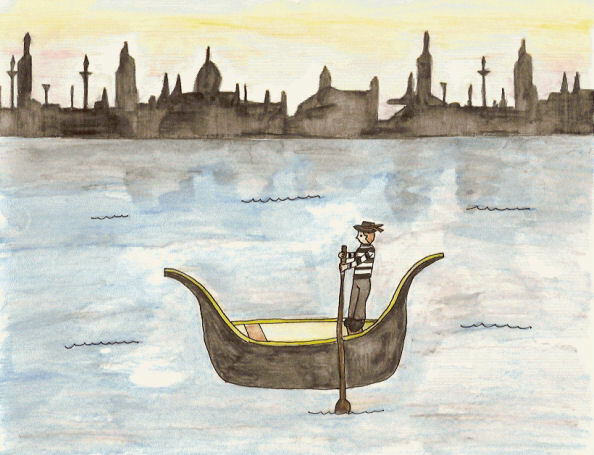 The next morning, after a good breakfast, he went back to his gondola. He wore his best black and white striped shirt and his new hat. He spotted a family with three children heading towards him. Luigi laughed out loud. "No way. Luigi is not going through this again." He pushed off with his oar and rowed away from the people. He spent the entire day alone, not taking anyone for a ride. He stopped to smell the flowers growing in pots on window ledges. He towed down the Grand Canal and watched all the other gondolas. He sang any song he wanted, even if it wasn't romantic and he stopped to eat a bowl of spaghetti when he felt hungry. "What a wonderful day it is." Luigi grinned. He didn't make any money that day, but at least he didn't go to bed with a headache.